we americans really have no shortage of goo-filled cake things. PLEASE! 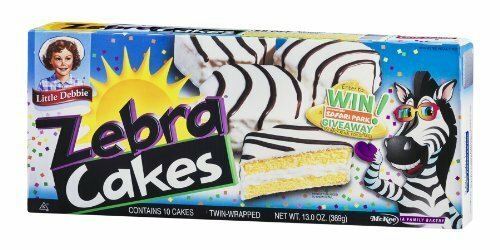 let us not forget Zebra Cakes! *they are especially good when refrigerated. Re: The King's Paws OK, this is not meant to be a harsh reprimand by any means. I really intend it more to be a friendly reminder to people. Reading over my response below, I am not sure it comes across as light as I mean it to, but I still want to post everything I have to say on the subject, so here it goes. I know the King's Paws is supposed to be a friendly place to gather and chat about whatever, which is great and I don't want to discourage that. But I do want to draw a bit of a line. This forum is supposed to be for fun and and friendly exchanges. We know nothing about each other outside of what members choose to share about themselves and in some cases, that is basically nothing. We don't know how old a member is or is not. We don't know if they are suffering from depression or have other challenges in their life. Not everyone chooses to share such things in an open forum. Also, just because a member does not post in a certain area does not mean they can't see it. I often see things that are posted and don't respond, that doesn't mean that it wasn't seen. So, my advice is to not post any comments here that could be construed as mocking a member. Particularly if they are a member that does not post in here. It might be that they don't feel comfortable posting in this section, tbh. If you find you are frustrated with a member, tell them (in a friendly way), tell a mod, DM another member and vent privately if you have to. But please don't use this section of the forum as a way to join each other in mocking people. It really can come across as mean spirited even if that is not what is intended. It can make members not involved in any way leery of posting for fear they may face the same thing. Always assume that who ever you are talking about is reading whatever you post here because they can and always remember you know nothing of their real life. Even if you mean your posts as light hearted exchanges amongst friends on the forum, to those not participating in the conversation, it may come across different than you intend. Even people that are just lurking and in no way involved may see this and become hesitant to become involved in the forum. I apologize if this in anyway comes across as over-zealous or unfounded. I really do want it to be more of a light reminder before things get bad. Just be nice. Have fun in ways that are not at another member's expense. People talk about liking it here because it's friendly, and I think most people would agree that we want new members and lurkers to feel welcome. This reminder is more to preserve that than anything else. Then made my bag to go cool my head and do some lines at the swimming pool. Went out to find my just services and pumped up bike with a totally flat front tire. For no apparent reason. Well Nora, maybe if you stopped doing coke at the swimming pool, you'd remember what happened to your bicycle. Best wishes, Nora. I'm sure your stream of bad luck will soon come to an end. You really shouldn't drink soda before swimming. Wax, Vin and Kelsier disagree. Re: What's the point of romance in fantasy? Thanks Rukaio, I was a bit at a loss for words myself, you nail my sentiments. As for TBM, I'm off this conversation, since you happily say "people don't believe in this", and when put upon written proof that many do, you reply that they don't know what they're talking about, since they weren't put in that situation. First off you can't tell, you don't know them, but more importantly, you were talking about the wider public's opinion, not enlightened opinions. Newsflash : opinions are like arseholes, everyone's got one. If people's opinions could be dismissed because they weren't based on first hand experience, there would be a lot less magazines for sale, and a lot less youtube videos, a lot less everything, if you catch my drift. Just because you don't like people disagreeing with your views doesn't mean that you can dismiss it or reshape your exigencies to make arguing harder. I'm also mildly offended that you won't take my own word of my own experiences as true, so apparently you can only accept "for argument's sake" that people party after a life endangering event... Great, never mind what I personally witnessed. I assembled some serious proofs to back my first hand accounts, but actually can't muster the will to offer rational arguments any more, if they're to be disbelieved, or labelled under "bad characterization". The number of people who agree on a premise has no bearing on the validity of that premise. I don't want to be preposterous and speak for everyone on this thread, but I do believe that this sentence pretty much seals this entire topic. It appears that even if every single one of us where to offer personal opinions as well as examples, we would only be part of this "wide mass" who is wrong–no matter that this mass of wrong people are the one buying the books that aggravate TBM–and so there is nothing we can do to change his mind on the topic and might as well drop it before we get into more damaging arguments. Re: Ummmmmmm I think he's screwed. Yeah that's too short for me, like them a bit bigger so I can get invested in the characters. Damn, freaking fantastic! Brilliant written passages, great dialogue banter and tons of graphic violence and backstabbing. What's not to love? It may seem straightforward in its revenge story, but the beauty of it is the gradual revelation of facts. The main characters is wronged yes, but she's no saint either and various times I wondered if she actually didn't deserve everything she got. And her brother was even worse. Shivers might've been the only one to feel sorry for as he was the only one trying to be better. Or maybe like Logen he was just lying to himself. A very curious cast regarding their quirks and abilities. A good thing because this book is so long, nobody has really any admirable trait and yet it was a blast to read about all these people. Best Served Cold is my favorite Abercrombie I've one so far. I can't say I liked or related to any of the characters, but they were fun to read about in some kind of sick way.